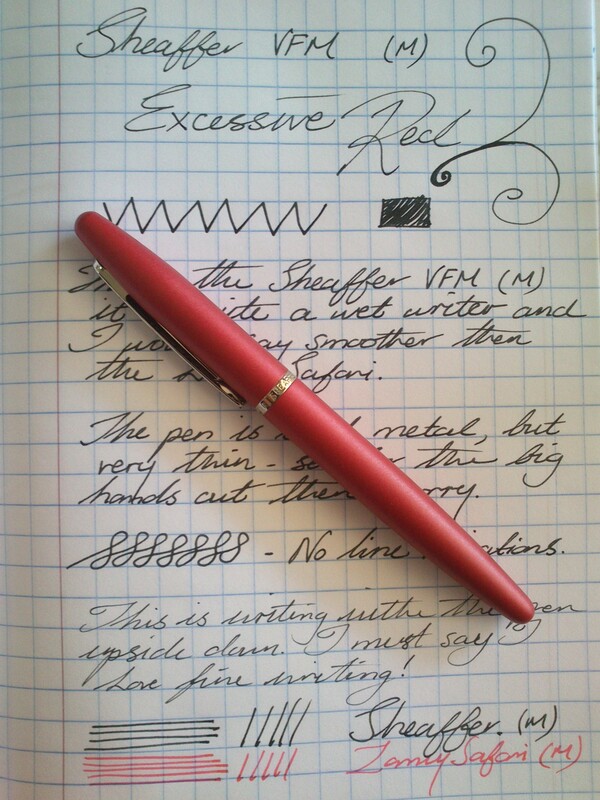 Today I have for you the Sheaffer VFM fountain pen in excessive Red. 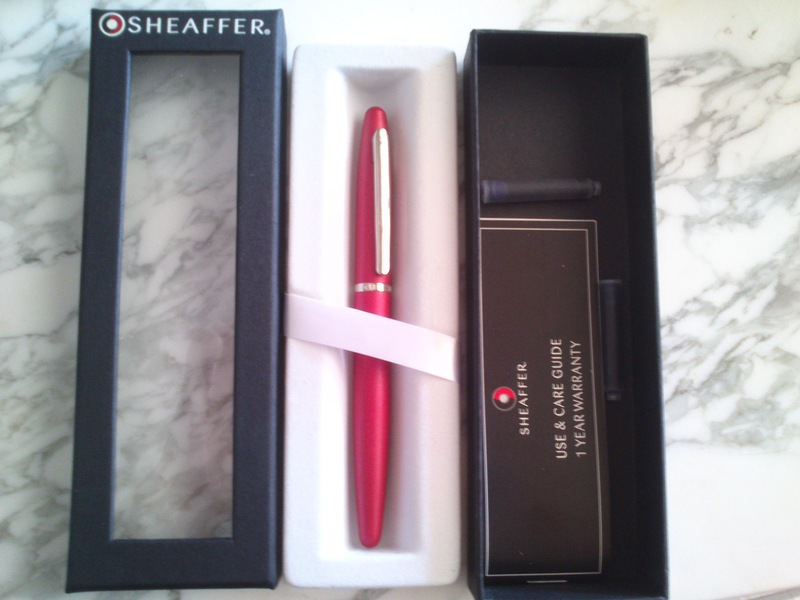 I like the box – it really shows off the pen straight away, the white section that the pen rests in is a felt finished plastic shell. Underneath the plastic shell is a 1 year warranty along with two standard international cartridges (a black and a blue). The finish in the pen in unique to anything I have seen before, its a matte finish that feels almost soft to the touch. The paint job also has a lot of depth – even though it is matte it seems to have a few scattered shimmer particles underneath the layers. 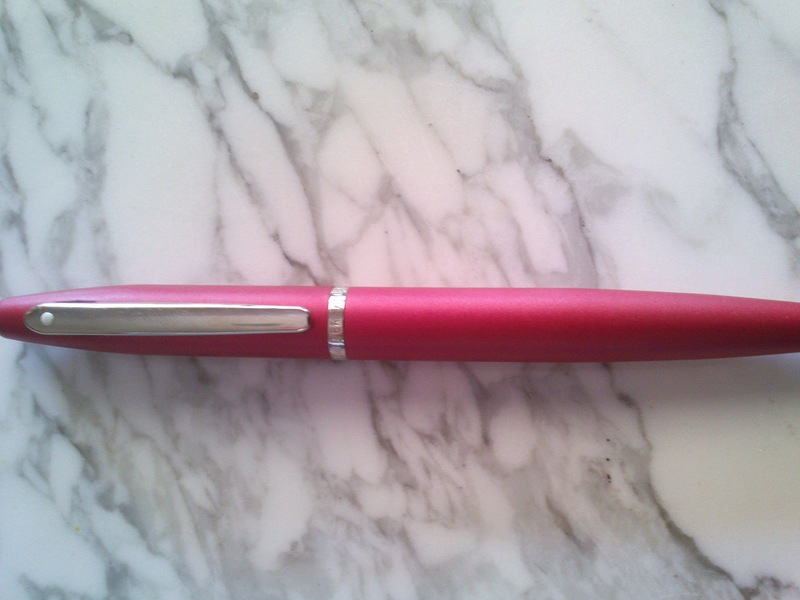 This is not a sparkly pen – it just gives the pen a nice sheen, to the matte finish. The hardware hmmmm, again the hardware is unique – It is neither pure gold or silver in colour, its almost a mixture of both. The clip has the iconic white dot, while the metal ring has Sheaffer engraved all around. Here is a close up of the clip compared to the pure silver nib. 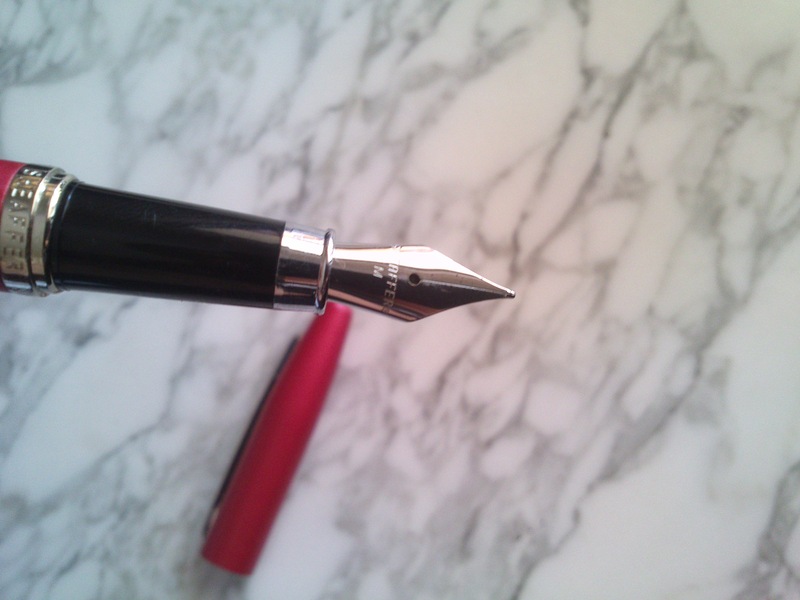 Again – you do not get a choice of nib, it comes as a medium (M) by default. 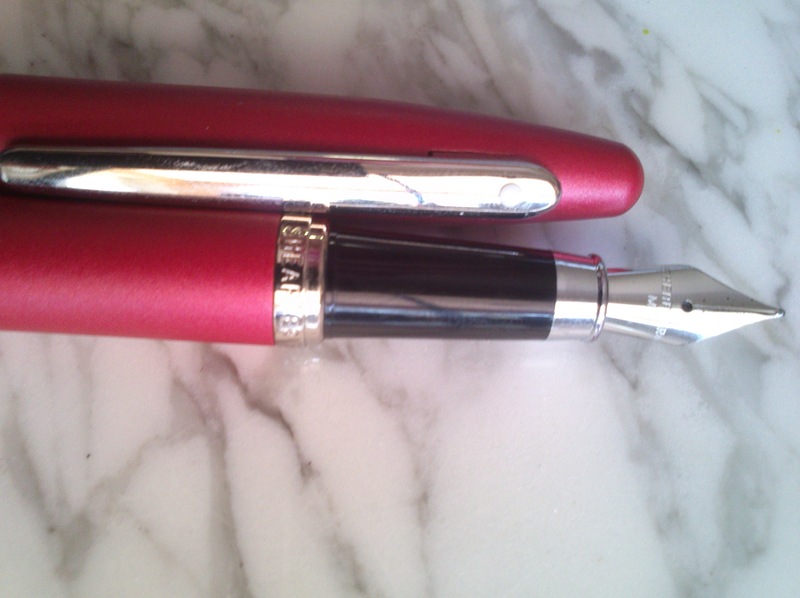 Sheaffer is engraved onto the nib, along with the nib size. The nib thickness is a touch finer then the Lamy Safari medium. 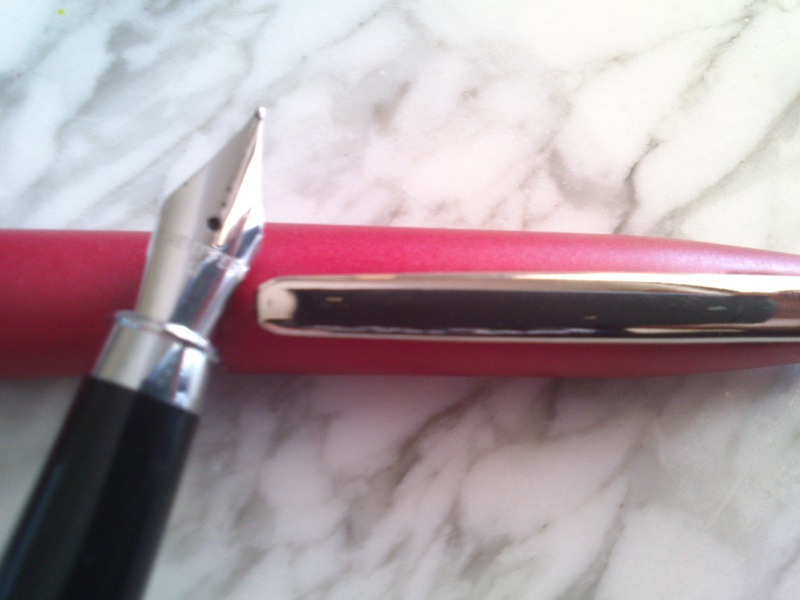 The nib colour is silver as is the metal ring by the grip section. The pen is a bullet design and it is light and thin… so thin in fact that I think that anyone with large hands will not find this pen particularly comfortable unless you quite happy using a basic bic pen. Even so, it’s about 1.5cm shorter then the bic with the cap un-posted. The cap can be posted, but its not a tight fit. It will defiantly have to be re-adjusted once in a while. Personally I like this pen, then again I don’t have very big hands so the small size is not really a big factor to me. 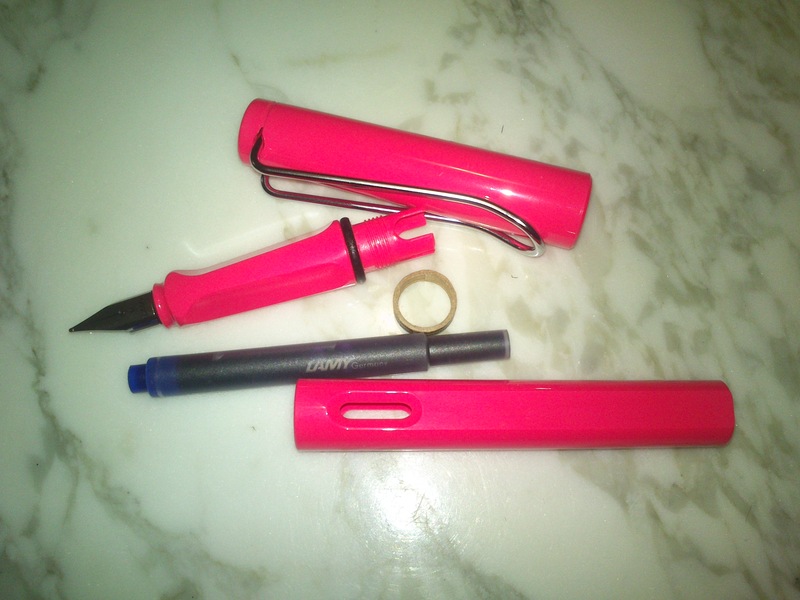 It write’s wetter, with a slightly thinner line then the Lamy Safari but with more tooth. The nib is not scratchy (at least mine wasn’t – not sure how the quality control is with these pens) , but you can feel the paper. 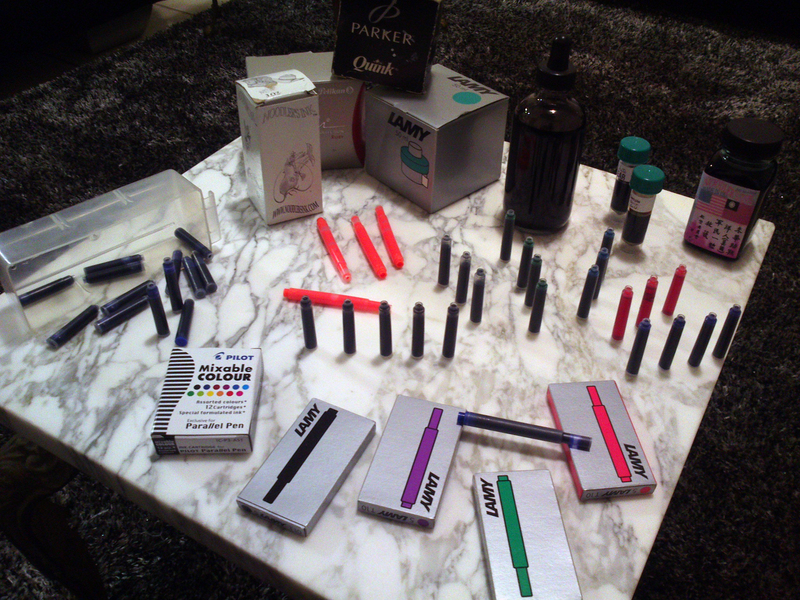 Just a quick post with an overview of my current fountain pen ink stash. I plan on reviewing them one by one – which one would you guys like me to review first? Parker Quink – Black, Noodlers – Black Swan In Australian Roses(old formula), Pelikan Edelstein – Ruby, Lamy Turquoise, Noodlers X-Feather, Pelikan 4001 Black, Sheaffer Skrip – Kings Gold, Noodlers – Air Corp, Generic Cartridge’s Blue, Monteverde – Florescent Orange Cartridge’s, Pelikan Cartridge’s – Black, Pelikan Cartridge’s – Blue/Black, Pelikan Cartridge’s Green, Pelikan Cartridge’s Turquoise, Pelikan Cartridge’s Red, Pelikan Cartridge’s Blue, Pilot Parallel Mixable colour cartridge’s assorted 12, Lamy Cartridge’s Black, Lamy Cartridge’s Violet, Lamy Cartridge’s Green, Lmay Cartridge Blue and finally Lamy Cartridge’s Neon Coral. schadenfreude: Is pleasure derived from the misfortunes of others. 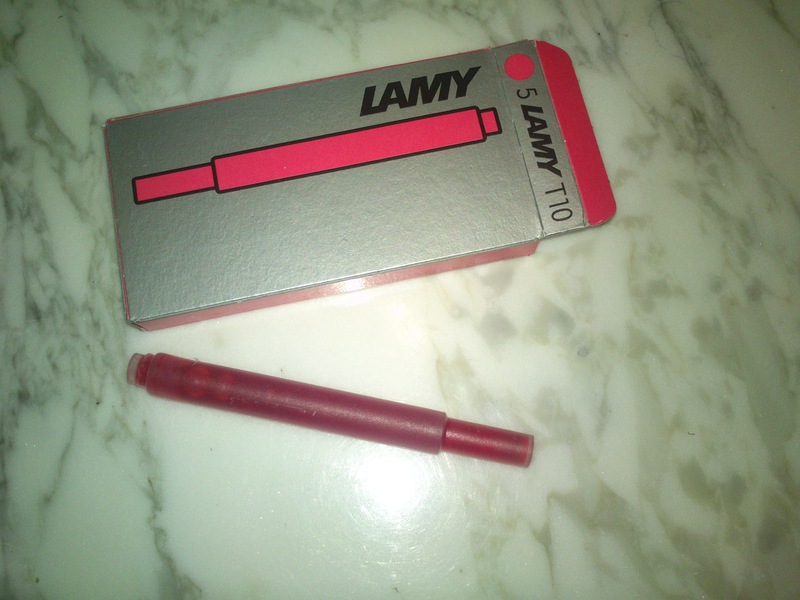 So I have had a Lamy Safari for around 2 years now, I initially bought it at Exclusive Books in Bedfordview. 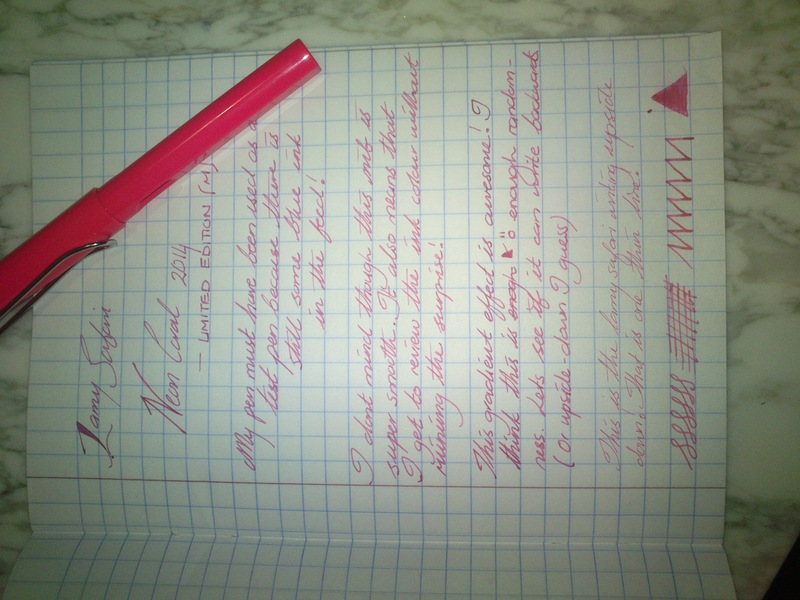 At the time I was fascinated with demonstrators and decided to buy the Lamy Vista. 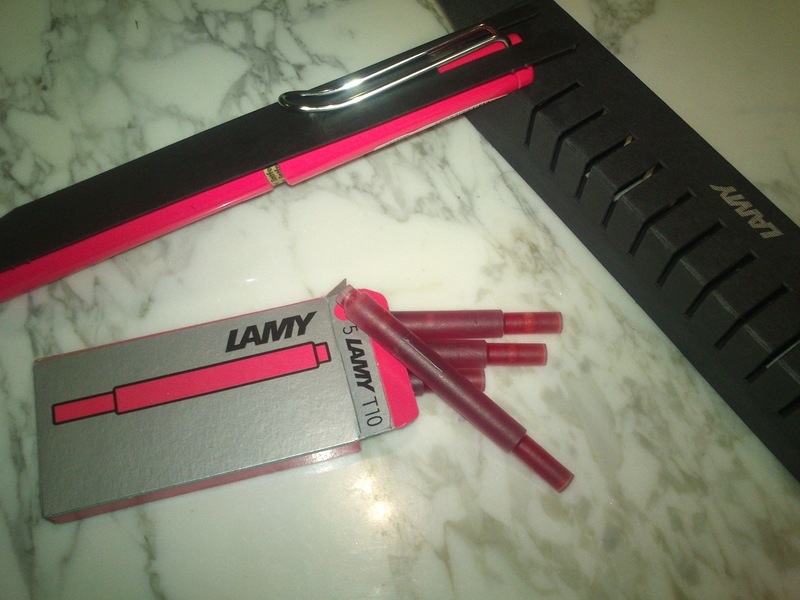 The Lamy Vista is simply a clear or ‘see-through’ version of the Lamy Safari. Recently I acquired my second Lamy Safari and decided to focus my review more on that one since the packaging and pricing information would be current. I’m will do a later post on how the Vista has held up and I few differences that I’v noticed between the two pens. 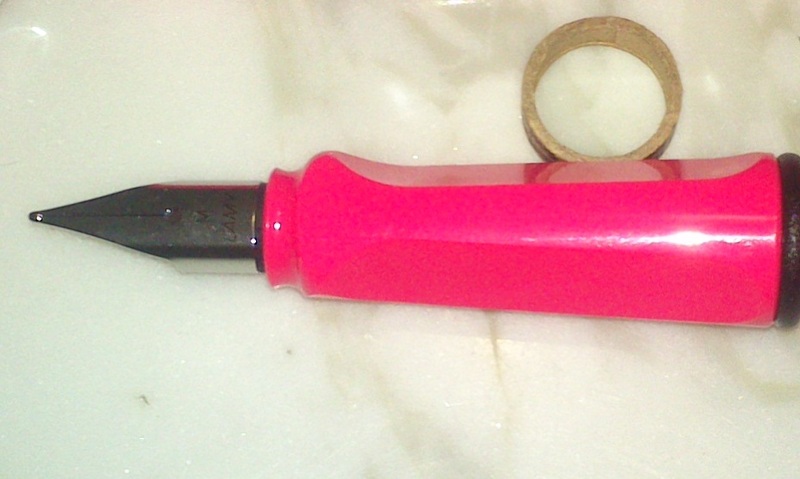 But First….. Say hello to the Lamy Safari 2014 Limited Edition in Neon Coral! 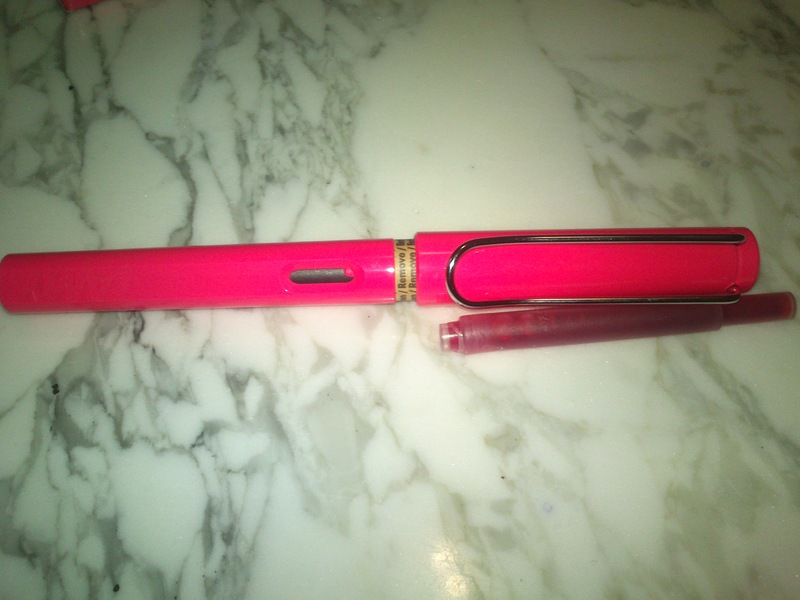 When I first saw this pen on the web I though it was pretty – defiantly a mix between pink and orange, perhaps leaning more to the pink side, but defiantly coral. The neon part? Eh, it was bold and bright sure, but I DID NOT get a neon vibe from it. I really regretted not getting the neon yellow when it was available, so I thought what the heck – lets get this one as a consolation prize… 2 years later I know, but hey – a girl’s got to eat. The pen comes in a lightly textured black cardboard box with cutouts on opposite sides. 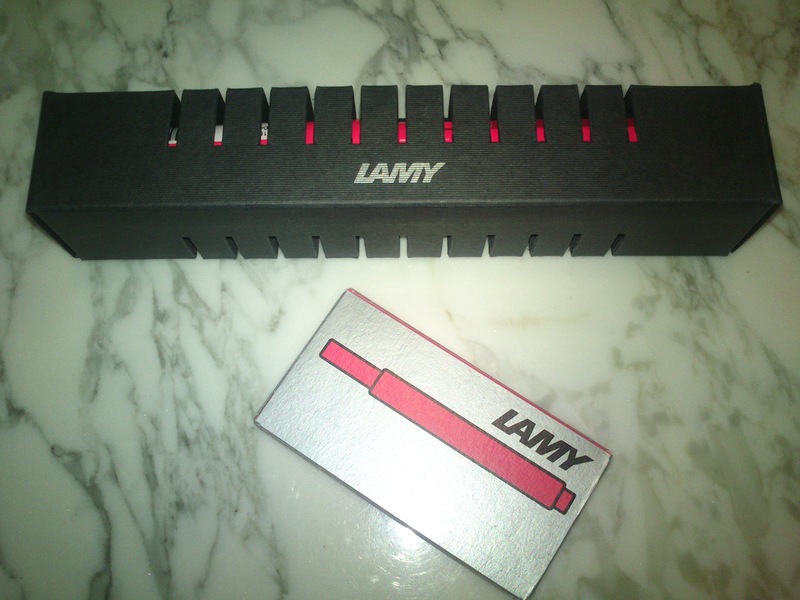 On the box is a printed silver Lamy logo. I like the packaging, its modern with a timeless aspect to it – but its still cardboard, so I don’t mind throwing it away either. 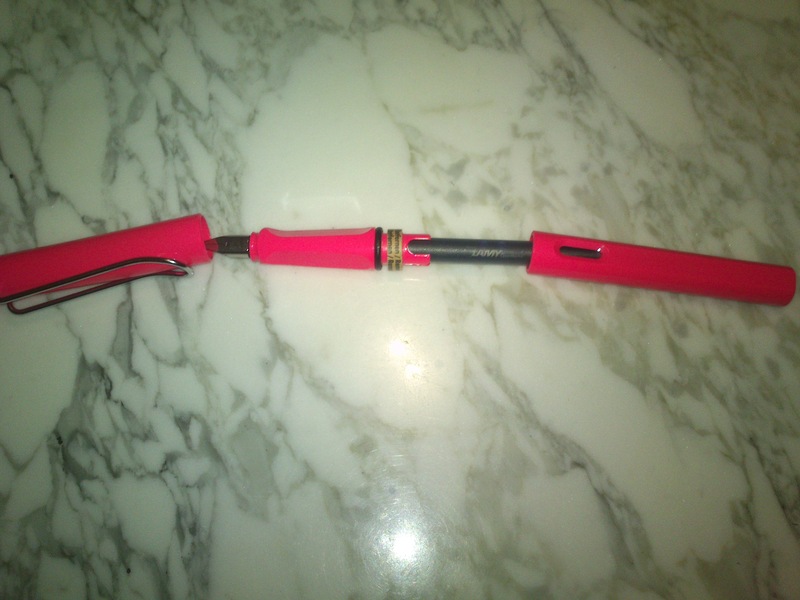 As you can see in the picture, I got the matching cartridge set to go with the pen. 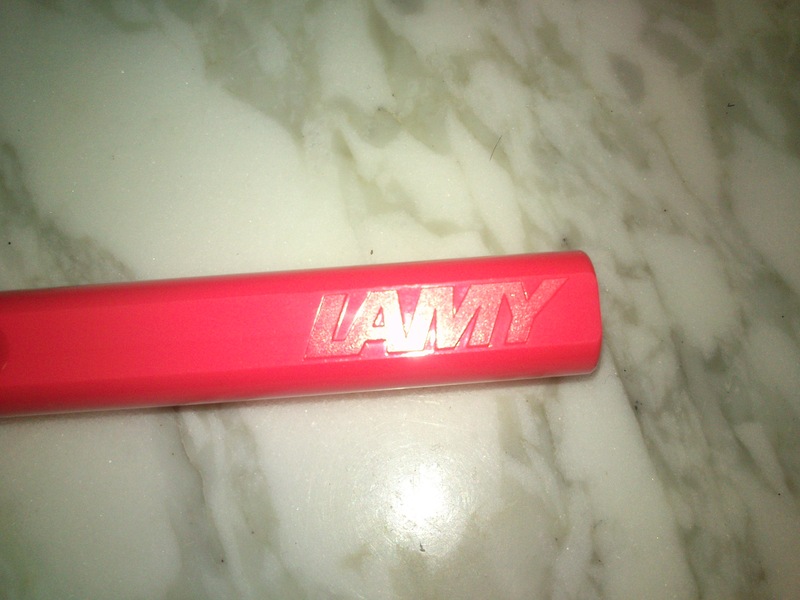 As far as I understand this is a limited edition colour, also called Neon Coral. First look at the Lamy Safari. Inside the box is the pen attached to a piece of cardboard, this keeps the pen in place so you can get a peek at the pen through the slits in the box. The cartridge box is pretty basic – silver with an image of a cartridge in the colour of the ink and they Lamy logo in black. Inside the box is a 5 cartridges. And all I have to say is wooowza! This is one neon pen – and I mean N.E.O.N – as with all neon things it is extremely difficult to get an accurate colour representation, camera’s just seem to go ‘Oh Hell No’. So instead of trying to capture the colour perfectly – I tried to capture the neon, but even so – this pen is at least 2 x brighter in real life. View of the Safari neon coral. Safari neon coral in order of dis-assembly . Close up of Lamy debossed logo. Inserting the cartridge is easy – simply open the pen up, push the wider section of the cartridge into the feed, give the cartridge a few gentle squeezes, screw it back together and your pen should be good to go. A few things to note before I get to my writing sample. 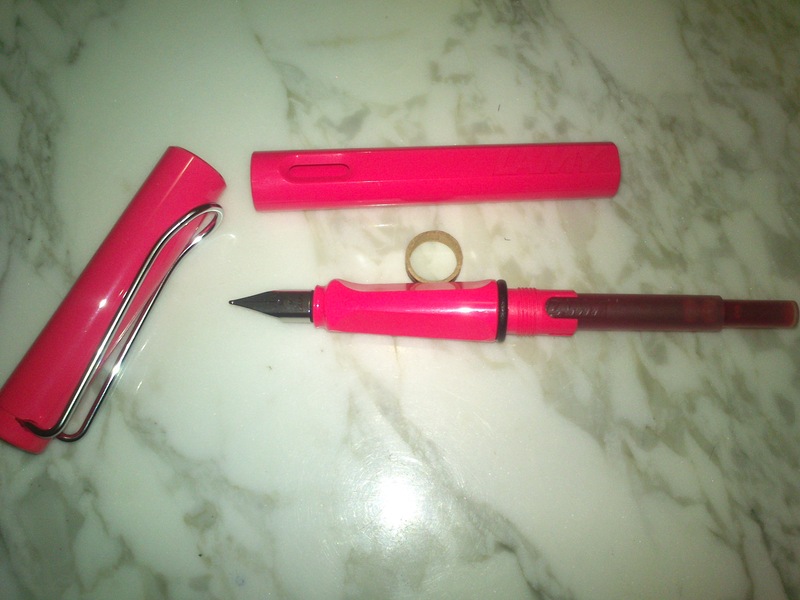 Lamy does make a converter(Z24) for the Safari, this allows you to use bottled ink – but it is proprietary, so you have to buy the Lamy one. View of the safari ink windows. Another thing to note is that there are two ink window cutouts in two places. Very useful because it lets you know when your ink is running low, but because of this – it can never be converted to an eye dropper. Lastly – the grip section is basically a triangle with rounded corners. While this doesn’t bother me in the least, it will annoy people who tend to hold their pens differently from most. If you tend to twist your pens while writing or grip your pen with four fingers, you may want to think twice about buying this pen as I can see this becoming uncomfortable during extended use. On the other hand, the Safari provides a guide on how to correctly hold a fountain pen. This is extremely useful for people who struggle to hold and write with fountain pens correctly. 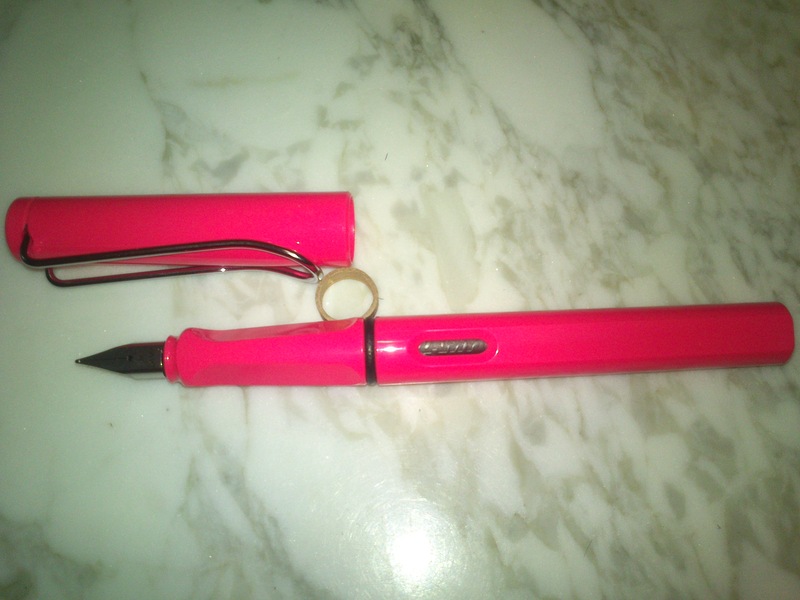 I spent a full half hour writing with the Safari, it is a light pen – so no hand cramps, and as I mentioned – i don’t mind the grip section so for me that was also problem free. The nib was smooth, smoother then my Lamy Vista but oddly enough drier. There was no skipping or dry starts – it just puts down less ink then the Vista. I’m not sure if this is the ink, or because my Vista had just loosened up after 2 years of use. 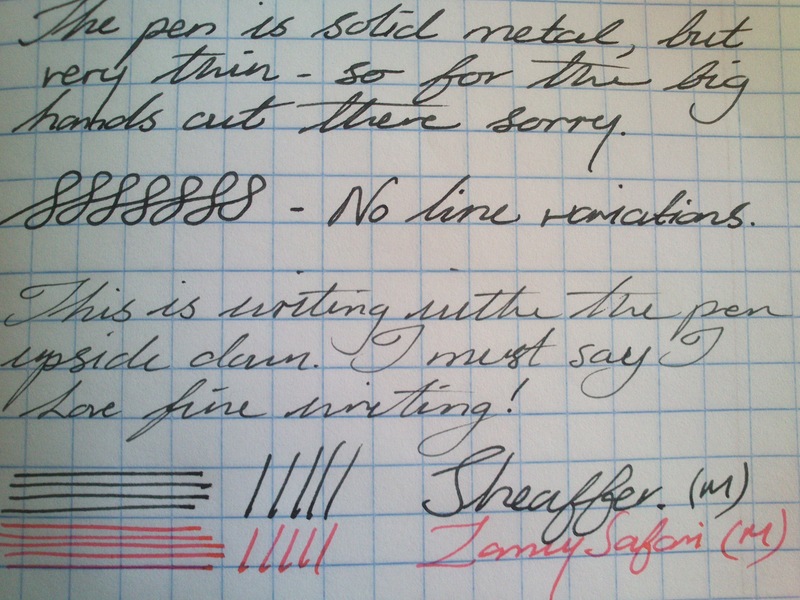 There are few tricks to increase the ink flow – but I wont be covering them in this post. This pen retails for R 349.00 – R 349.95 and the cartridges for R39-00 – R39.95 per box of 5, depending on where you purchase it. It is available from the following stores. 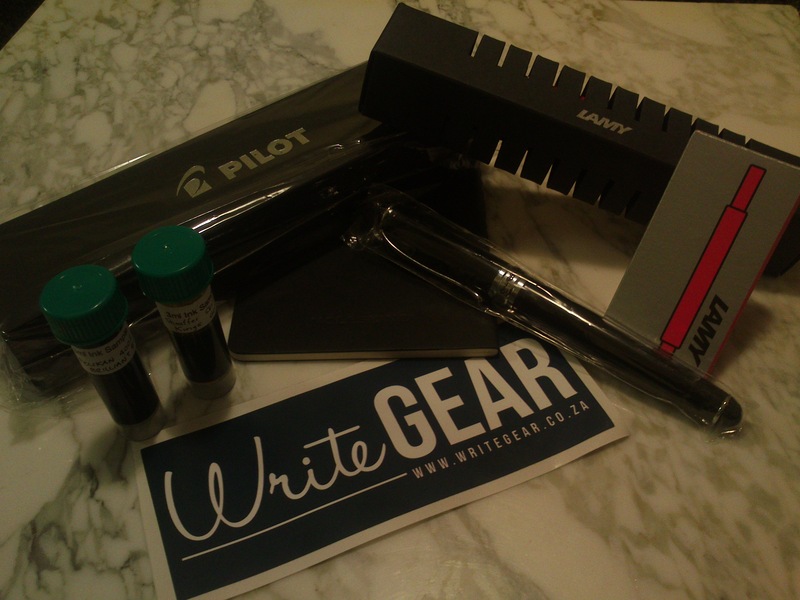 Soooo… I know I said my first review would be the Lamy Safari, but I just received a package from a new company on the web and decided to talk about them first. 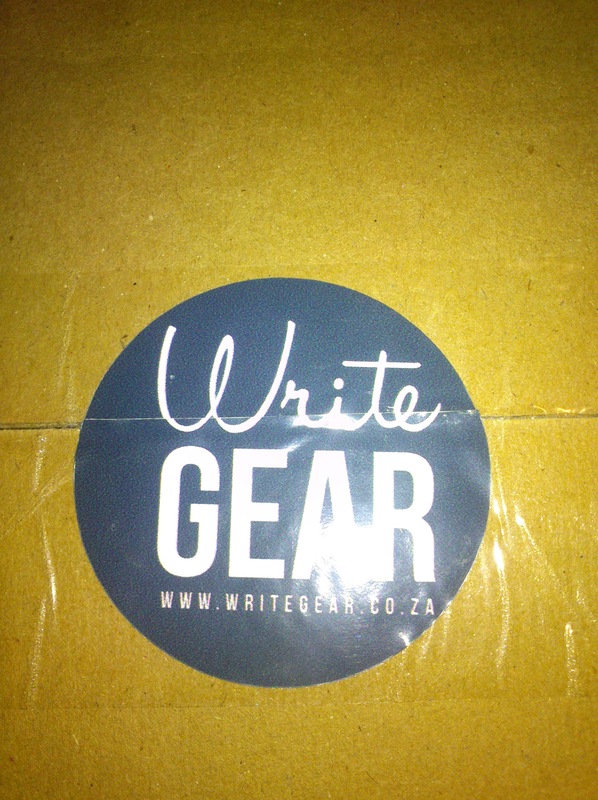 The companies name is: Write Gear – you can find them on www.writegear.co.za, they are a new SA online store specializing in fountain pens and ink. 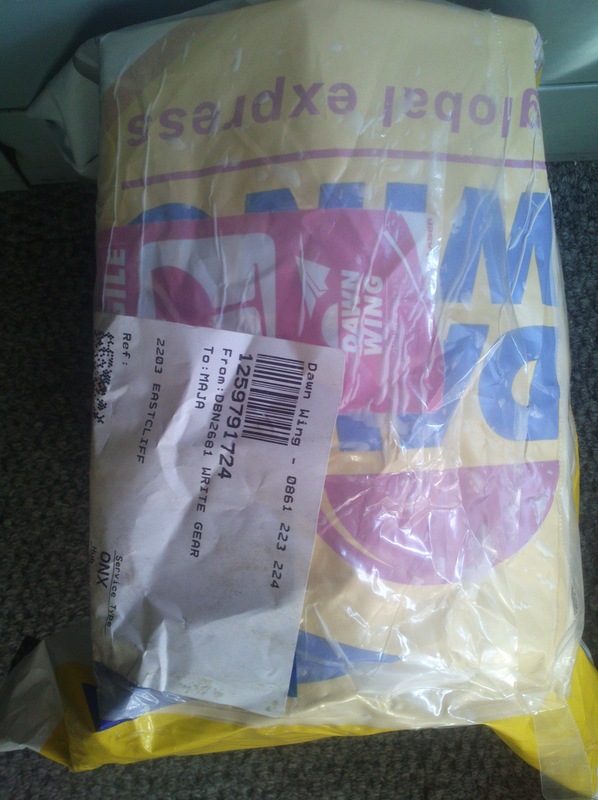 I am not going to start with the products in the box but rather the actual box the products where delivered in. 🙂 (I’m mean that way) – The parcel was delivered via Dawn Wing courier service. Inside the dawn wing plastic bag is a plain brown cardboard box with the Write Gear logo on each side, as well as a Write Gear sealing sticker that you need to ‘break through’ before you get to see inside. 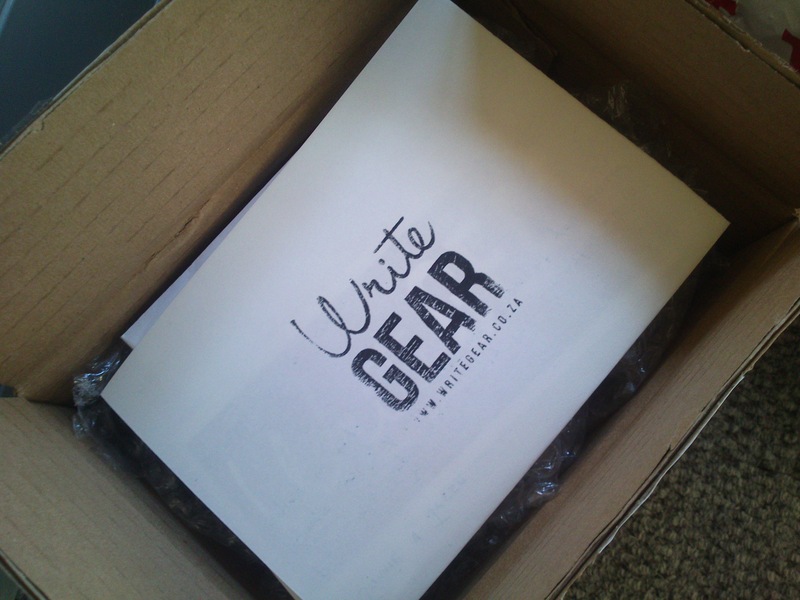 First view of box content – a hand written note from Write Gear. Box with lottts of bubble wrap. 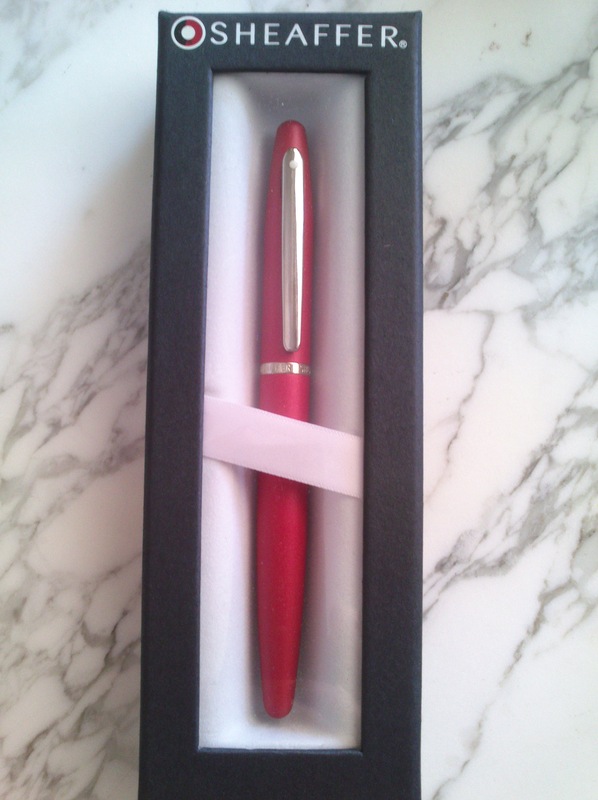 The note is a really nice touch, not only does it show you that some-one has taken the time to hand write a note – but you know its personal because it has your name on the top and a reference to the actual products in the box. Inside the note I also found a Write Gear sticker. In my opinion the best part about a hand written note – is the fact that you get to see how a particular ink looks like. In this case Sheaffer Skrip Green.This allows you to decide if you would like to buy it, or if you already have something similar in your current collection. 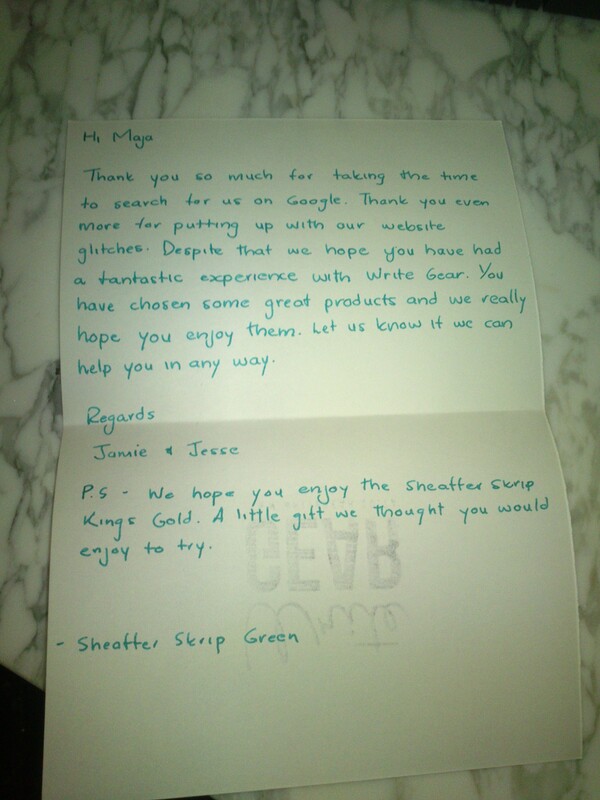 Hand written note using Sheaffer Skrip – Green. And finally – the actual products. Each product comes individually wrapped in bubble wrap and colourful washi-tape, you also get sweets in my case strawberry SuperC. I ate these while contemplating if I should rip the bubble wrap apart, or pretend to be civilized and find a pair of scissors. 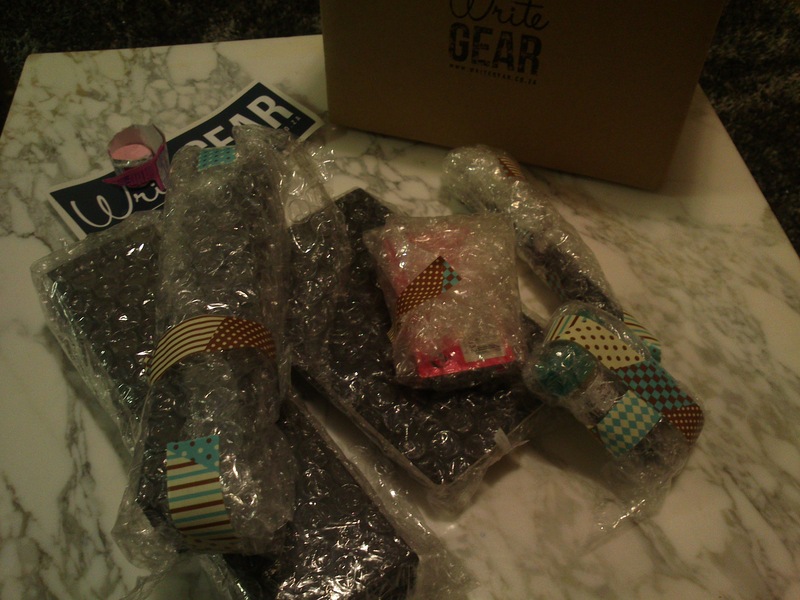 Write gear haul bubble wrapped. Each of these products will get there own review in the coming weeks so i’m not going to go into detail. A few things worth mentioning though is that: Currently the website has some introductory offers running. 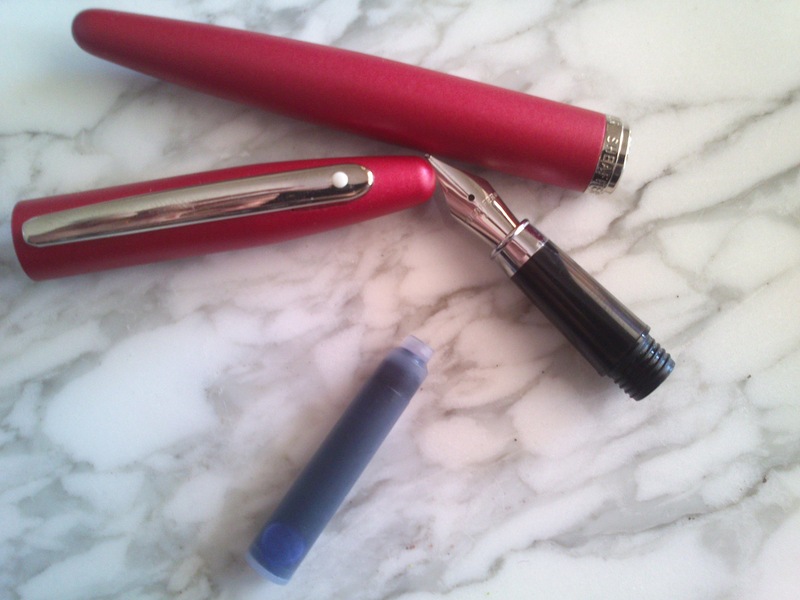 These offers are great value for money and an easy way to find out if fountain pens are for you. I also received an additional ink vial – I must say these are pure genius. It allows you to try out an ink before you commit to buying a whole bottle. To my knowledge the only other web company that does this is in America. 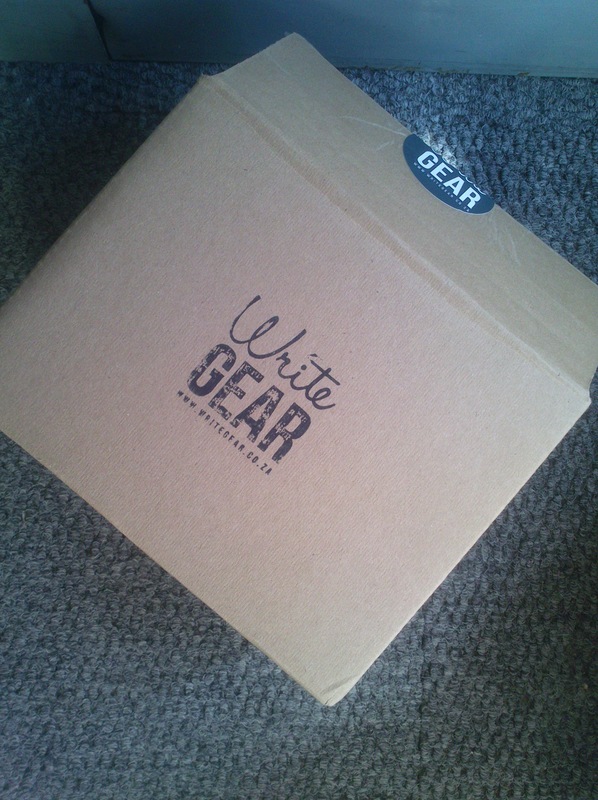 Dealing with Write Gear has been an utter pleasure and I look forward to my next order. In addition, some South African site’s that do offer the product turn a $3-95 platinum preppy pen into a R290-00 pen with a ‘saving’ of R165-00. Seriously? A saving? Its a $3-95 pen at retail, not even cost! Oh and btw this excludes local delivery. I can import it myself for less – and that would include delivery. So I decided to start a blog, that would provide reviews of stationery products that can either be bought in South Africa, or can be imported without much trouble and insane shipping fees. 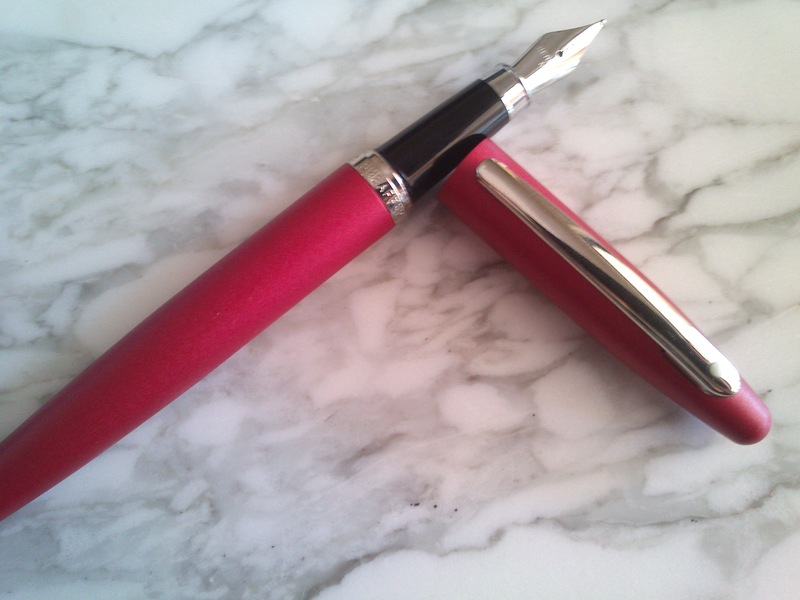 First on my list – one of the easiest fountain pens to get hold of in South Africa, and without doubt – one of the most recognizable fountain pens in the world… The Lamy Safari.